Artefacts need to be interpreted in their historical contexts for their various significances to be appreciated. My investigations of the museum’s ‘southern Italian’ objects* (which are ongoing) seek to develop their historical value beyond their roles as nice illustrations for history books or as milestones in the history of ‘art’. The vast majority of the objects studied are pieces of metalwork made of gold, silver, bronze or other alloy. These include earrings, brooches, finger-rings and other personal items such as strap-ends and mounts used on belts or harnesses. They date from about the 7th to 13th centuries. The basis of much of the British Museum’s ancient and medieval collections go back to its mid-18th century origins (founded in 1753). In this period before scientific archaeological method and recording, the information about where the objects came from – their provenance – is often lost. As a consequence, many early museum objects are ignored by historians and archaeologists because of the lack of information about their ‘original context’. However, I believe that by looking at the histories of how and from where these objects were collected, and comparing them to better provenanced objects in other collections, we can start building up historical contexts around them. One of the most enigmatic of southern Italian pieces is the Castellani brooch (pictured). This gold and cloisonné enamel disc brooch, dating from roughly the late 7th-early 8th century, is reputed to have been found in Canosa di Puglia according to the 19th century accession register. It was bought by the British Museum from the famous Rome-based jewellers, the Castellanis, in 1865 with a number of other antiquities. It is remarkably similar to a pair of earrings found in a female Lombard grave in Senise (Potenza) and another disc brooch believed to have been found at Comacchio, north of Ravenna. All these objects bear the same distinctive enamel of a female bust. The Senise earrings, now in the National Archaeological Museum in Naples, were found with other gold and enamel objects in a Lombard grave in 1916. The reverse sides of the earrings bear impressions of solidi from the reign of the Byzantine emperor Constantine IV (668-685) providing a useful datum post quem. 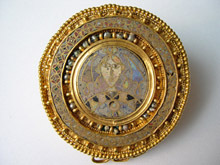 The Comacchio brooch was acquired by the American collector Henry Walters, possibly in the late 1890s, and is now in the Walters Art Gallery in Baltimore, USA. Although the similarity in their workmanship has been noted by art historians in the past, the significance of the female head remains to be interpreted. It is hoped that further study of early medieval Italian iconography will help provide more clues about the meaning of the icon. Interpreted variously as both Byzantine and Lombard in artistic style, their place of manufacture is also debatabale with both Byzantine Naples and Lombard Benevento being put forward as a place of origin for the Senise ‘treasure’. Could Ravenna too be a candidate? If it is accepted that both brooches were found in the same place (the earrings being the only object with an archaeological provenance) they were last used by an early medieval person, these objects will have travelled long distances to and from politically heterogenous regions. What could the significance of these movements be? The digest of this paper can be read on the AIAC News journal website. *in quotes as one might argue what a southern Italian object is considered to be. I am quite interested on this subject as I my family is from Senise. In our town there is a Castle dating to 1200 and while it is not been attributed to Norman construction it was occupied by them during the Crusades and shortly after. As far as the Lombards it is common knowlege that they migrated down from the North and into our region in the south. Many chieftans were probably establishing themselves and assimilating into the local populus. I believe that the local populus of Greek origin of the Coni and or Oniffi tribes and todays dialect Senisie still has remnants of Greek. I am not a langauge expert but theorize it. It’s also known that the Lombards did have ties to Byzantium and you can also appreciate that influence in the region as well. One item of interest I don’t think the bust is of a woman but a man. Typical a Lombard as the style of hair parted in middle and down to mouth level…while shaved on the back of the head.